This Rumble ended on 2002-04-30 00:00:00.0. Ruler Elected by: Some watery tart in some lake flinging a sword about. Anti-Knights: The knights who say "Nooo! - No Ni--!" In a press conference yesterday Sturm Brightblade spoke out on the subject of his conflict with the knights of the Holy Grail. "Although I respect the decision and the strength it took these men to come forward and battle us in honorable combat I fail to understand just what started it all. From what I understand Gerard uth Mondar bumped into a 'Sir Launcelot' in a local tavern and from there it escalated into all of this (conflict)." 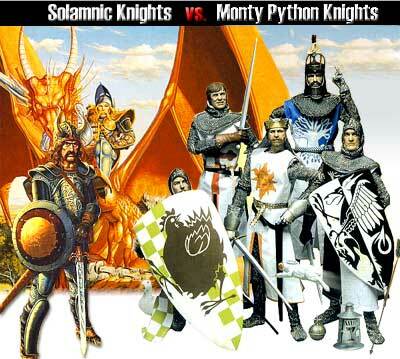 Asked if Sturm thought if his group would be successful in the challenge Sturm answered, "The better group shall win and that will be the knights of Solomnia, have no doubt about that. They can take their eldeberry wine and tales of vicious rabbits and join the kender." King Athur, the leader of the Knights of the Holy Grail, was outraged at Sturm Brightblade's comments and had this to say, "I am outraged at Sturm Brightblade's comments! As son of Uther Pendragon, from the castle of Camelot, King of the Britons, defeater of the Saxons, Sovereign of all England, I demand that retribution be paid for the insult done to my faithful Knight 'Sir Launcelot'! I do not know of these kender of which Sir Brightblade speaks but they can be no worse than the things we have encountered on our search for the Holy Grail. Unless you count the Castle of Anthrax... and that was not really dangerous from what I heard, and perhaps when the battle is complete we shall search fot he Grail there again!" At this the King started to bang two coconuts together and skip off to the west. When asked what started the conflict Sir Launcelot had this to say, "There I was surrounded by the enemy. I knew I was done for. The end would come swiftly, but not before I fell a hundred score of the enemy!- huh? What? Oh the altercation the other night with that Gerard fellow? Well he stepped on my newly polished boot and scuffed it. I told him to say 'Excue me', he denied doing it, and here we are now with both groups ready to kill each other." "I did not step on this knights boot!" exclaimed an outraged Gerard uth Mondar. "He was drinking heavily, sputtering something about some grail and claiming that if I had to face the perils he had seen I would be a real knight, not just a ruffian in 'pretty armor'. Then he put two finger pointing down under his nose and started to tell me about some creature with sharp and nasty teeth? Their entire team is made of mad men. I for one would would be happy to take this to the field of honor to settle the dispute. That is if they can get their heads out of their a**es long enough to find it!" Both parties departed the conference in foul moods.